How would you like to get started with rename scripts? I was intrigued by some of the new features in DO12 rename scripting, so I threw together a simple example to see how they work. In coding, not being able to see a full working example is often the only hindrance to getting started, so I thought I'd share the result for anyone who might be on the same track. I'll tell you upfront that I'm no Opus rename scripting expert! There are far more complex things you can do with rename scripts. Some features on this page are specific to DO12 and above. Please note that apart from the kind of rename scripts shown on this page, you can use Opus's traditional script functions to rename files. At some stage in your renaming career, you may be interested in checking out the custom rename script on my page about script functions, as it shows an example of a renaming operation that takes into account all the selected files considered as a whole, not just each file considered indepedently. Ten minutes to code, six hours to write this page! We'll work with a simple example: converting file names to camel case (i.e., from something-like-this to somethingLikeThis). We'll start with a simple version that accepts four kinds of word delimiters in the file names: dashes, underscores, dots and spaces. Then we'll tweak the script so the user can check boxes in the rename interface to enable or disable these delimiters. The reason I say this stragegy is slightly incorrect is that starWars would be a correct camel case name, but StarWars isn't (the first letter shouldn't be capitalized). We'll fix this in the expanded version, where we'll give the user the option of whether to capitalize the first letter. Select the files, then click the Rename button on the standard toolbars (or my toolbar, Ren or Shift + F2). Now to execute the first step of our rename strategy, check the Modify capitalization box and select Capitalize All Words from the pull-down menu. Step two is to strip dashes, underscores, dots and spaces. We'll do this with a script. Next to "No script is defined", click Edit. Now delete the comments. At some stage you should read them, because they give you some important properties you can use for your scripts. But it might be easier if you first get the hang of how to write a simple script, and read the docs later. After deleting the comments, you should see this. This is the bare minimum for a rename script. OnGetNewName is the name expected by Opus for the rename function. That function will return the new file name. The parameter getNewNameData is an object (supplied by Opus based on the selected files) that contains details about the file names. At this stage, you could just write return "My All-Encompassing File Name" into the function, and it would work. But I'll give you an example with a bit more meat. The first two lines just assign the name stem and extension (passed to the function in the getNewNameData object) to some variables with short names. They are just there for comfort. Next, we define a basic regular expression. If you're not fluent in those you could use string functions to achieve the same. ✱ The two forward slashes are delimiters (the actual pattern is inside the slashes). ✱ At the end of the pattern definition, the g modifier makes the engine find all matches. ✱ The [-_. ] character class matches one character that is either a dash, an underscore, a dot or a space. var newstem = stem.replace(delimiterRegex, '') replaces all the matches found in stem by the delimiterRegex pattern with an empty string. 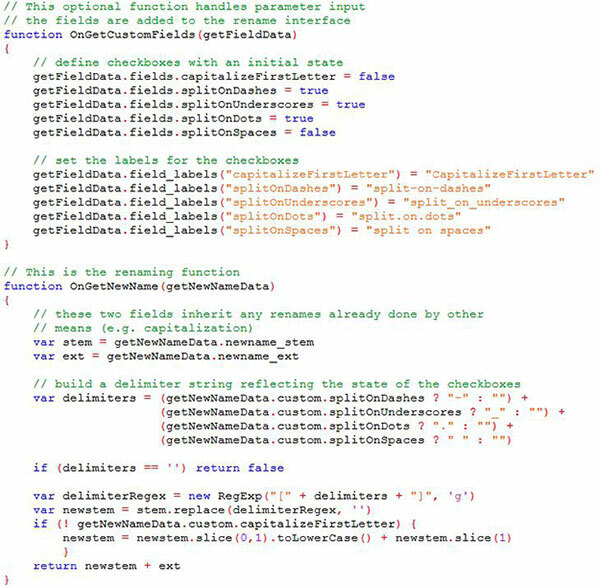 This gives us the name we want because the script works operates on getNewNameData.newname_stem, which is the name after the mods applied directly in the interface, i.e., the name after Title Case has been applied. If instead we were using getNewNameData.name_stem, we would operate on the original name. Press Ctrl + S to save the script, then try it by pressing Apply. Then revert to the original file names by pressing Undo. In the next version, we want to tweak the script to allow users to enable or disable the dash, underscore and dot delimiter. Next, select Save As to save the script with a new name. Call it CamelCase. Right-click the preset and move it to the right family. Hit the Refresh Preview button. Look closely at the interface: five new checkboxes have appeared! Of course, so far they don't have any effect on the rename action. How does the new function work? OnGetCustomFields is the name expected by Opus to set the rename parameters. 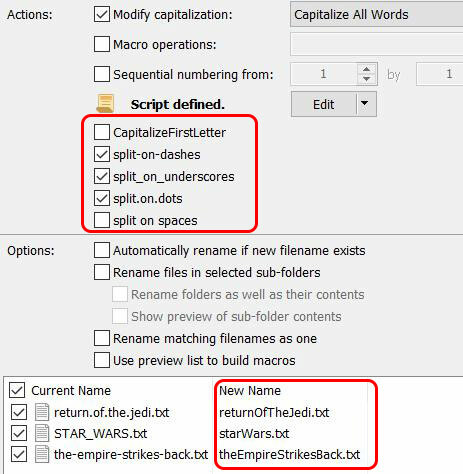 The first five lines create five checkboxes called capitalizeFirstLetter, splitOnDashes and so on. Three of the boxes are initially set to the checked state ( i.e. true), the other two are left unchecked ( i.e. false). The next five lines creates the text labels for the checkboxes in the interface: split-on-dashes, split_on_underscores and so on. Checkboxes are one of several kinds of rename configuration options offered by Opus, but they're the only one we'll be using today. There are actually very few changes from the original script. ✱ the assignments to stem and ext are unchanged. ✱ we build a string called delimiters which is a simple concatenation of the delimiters for which the boxes are checked. ✱ if delimiters is empty (no boxes checked) we exit the script. ✱ this time the regex delimiterRegex is almost identical to the one in the first version, except instead of always matching all delimiters with [-_. ], we build the regex by inserting the actual delimiters string. To build the regex dynamically, we use the RegExp constructor instead of an inline definition. ✱ the replacement statement is unchanged. ✱ if the capitalizeFirstLetter box is unchecked, since we have converted the whole name to Title Case, we bring the first letter back to lower case. ✱ the return statement is unchanged. That's it! This procedure is rather basic: you'll probably be able to think up a number of improvements and enhancements. I hope you found this stimulating and that you'll be encouraged to whip out your own rename scripts. Rename scripts are convenient, but you can also use Opus's traditional script functions to rename files. I highly recommend you look at custom rename script on my page about script functions, as it shows an example of a renaming operation that takes into account all the selected files considered as a whole, not just each file considered indepedently. ✱ The Rename Presets section of the forum. You may like to check out the other two.